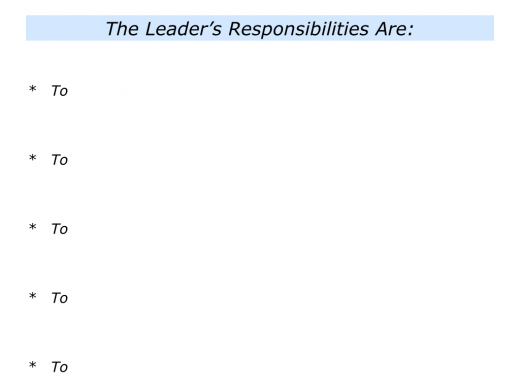 People must be clear on the responsibilities of both the leader and the team members. The contract should cover both the psychological and practical responsibilities of working together. Here is one approach to making an overall working contract. You can, of course, also make clear contracts about other aspects of working in the team. Gather people together and invite them to focus on the following themes. 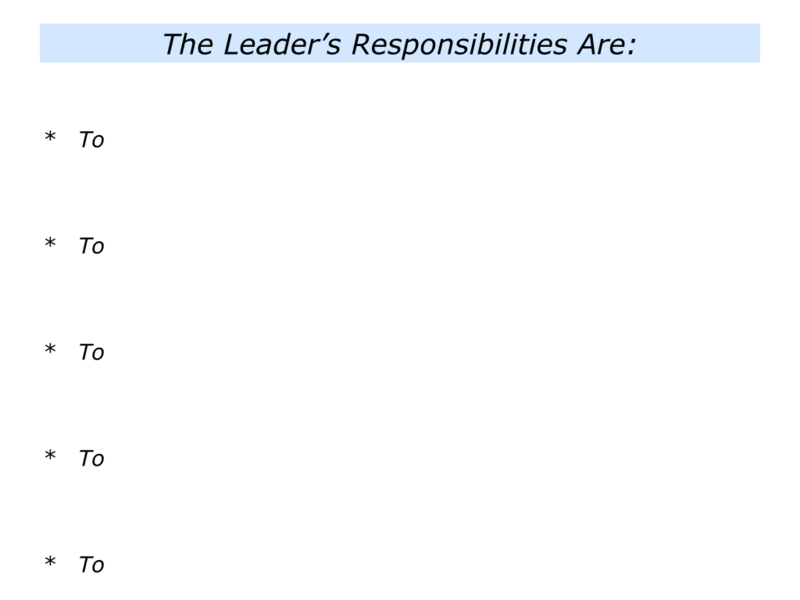 Prepare a Flip Chart with two columns headed The Leader’s Responsibilities and The Team Members’ Responsibilities. Give each person a set of Post-it Notes and invite them to describe what they see as the leader’s role in ensuring the team reaches its goals. Each person is to write one idea per Post-it, but they can write as many ideas as they wish. To provide a clear story, strategy and road to success. To give people a sense of ownership in implementing their part of the strategy. To manage upwards and provide air cover, protecting people from interference. To create an encouraging environment and give people practical support. To make clear contracts about each person’s contribution towards achieving the team’s goals. To do whatever is necessary to guide the team to success. There will be a chance to discuss these ideas later. But at this stage invite each person to go up in turn and put their Post-it Notes under what they see as the leader’s responsibility. It is also good if they can explain their reasons and give examples for each idea. They can then move onto the next stage. 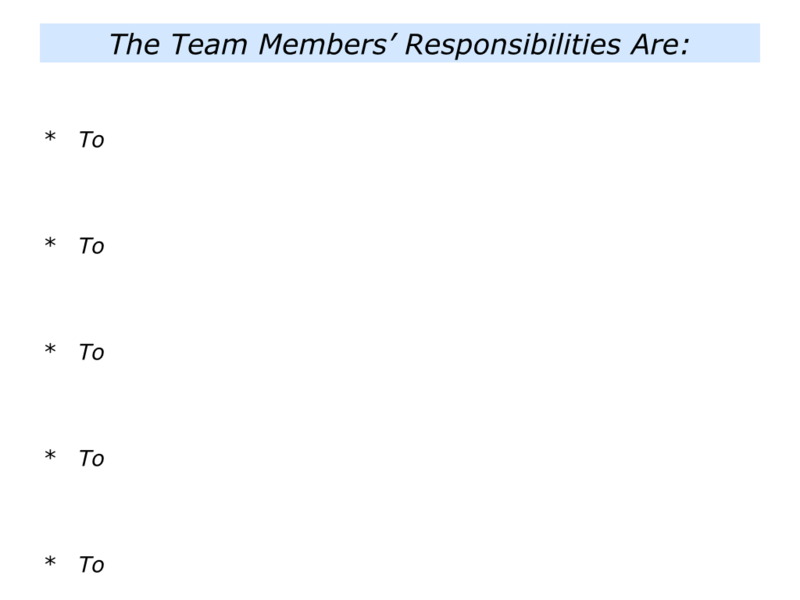 To choose to be in the team. To have a positive attitude. To understand the team’s goal. To make clear contracts about their best contribution towards achieving the goal. To find solutions to challenges. To deliver on their promises. To do whatever is necessary to help the team to achieve success. Again, invite each person to go up in turn and place their Post-its under what they see as the team members’ responsibilities. It is also good if they can give their reasons and examples for each idea. Looking at the ideas under the respective responsibilities, invite people to arrange these under themes and discuss the topics. 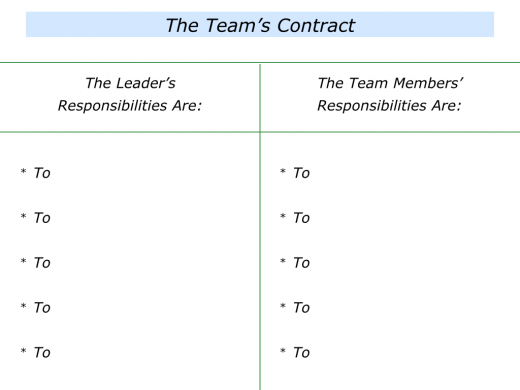 When you feel people are ready, invite the team members to agree on the team’s working contract. As the leader, you will have the final say, but team members often produce an excellent agreement. Conclude by writing the contract and, if appropriate, putting it in a place where people can see it each day. How can you use the contract? There are two main ways. It can provide a constant reminder of people’s respective responsibilities. It can be used when tackling difficult situations. If a person behaves badly, for example, don’t get dragged down into arguing about the details. Just go back to the contract. Ask whether the person wants to follow or change the contract. Sometimes it may be appropriate to alter the conditions, but then make sure the whole team are in agreement. 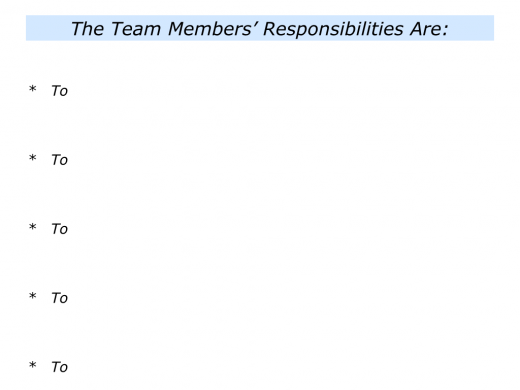 If a person continues to break the rules, however, they are choosing to leave the team. Clear contracting provides the basis for building a successful team. If you wish, try tackling the exercise on this theme. This invites you to do the following things. 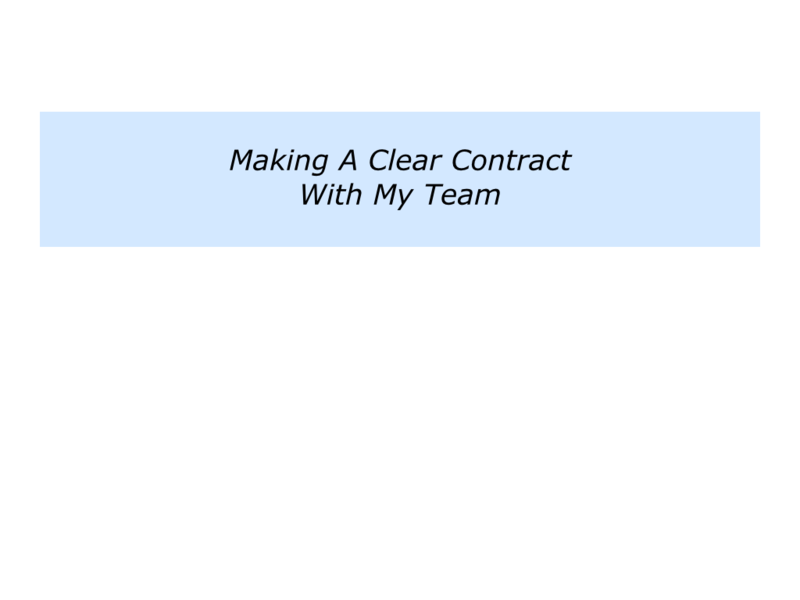 Describe the specific things you can do to make a clear contract with your team. Describe the specific benefits of making a clear contract with your team.